Scorpio, the eighth sign of the zodiac, has the mighty Pluto as its ruling planet. As per the Roman mythology, "Pluto" is the God of the underworld and wealth. The planet takes approximately 248 years to orbit the sun. It was reclassified as a "dwarf planet" by astronomers in the year 2006 and is no longer considered as a planet in astronomy. In the realm of astrology, Pluto is known as "The great Renewer". It is associated with that part of an individual, which demolishes, with the purpose of renewing. It helps in bringing the hidden, but passionate, desires of a person to the surface. The ruling planet of Pluto is usually associated with the term "Transformation". 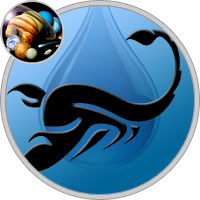 It bestows Scorpios with authority, individual achievement and the need to collaborate and share with others. The planet also has strong associations with power. At times, it is believed that Pluto rules the eighth house, in collaboration with Mars. The individuals dominated by it display qualities like charisma, mystical charms, reliability, patience, inquisitiveness, suspicion, flexibility and secrecy. On the negative side, they tend to be self destructive. Scorpios also have a desire to control, especially in love. The ruling planet of Pluto has influence over the generative system. It is mainly associated with hemlock, ivy, leeks, onions, black poppy, reeds, strong-tasting root vegetables, thorn apple, blackthorn and hawthorn. The lucky colors of those born under the rule of this planet are black, charcoal grey, maroon, blood red and dark red. The closest metal is Plutonium and the closest stone is Topaz. For those born under the sun sign of Scorpio, the lucky day of the week is Tuesday and the lucky number is nine. Intense Scorpio is ruled by Pluto, planet of power and control. Pluto is a tiny powerhouse, and a bit of a mystery; in mythology Pluto was the god of the underworld. Many Scorpios are also drawn to “dark” things, and often wear the color black, or a shocking tone like red or hot pink. Like Pluto, Scorpio’s power often emanates from a hidden source, even when you don’t say a word. Mysterious Scorpio is the zodiac’s most misunderstood sign. You’re so powerful that people feel your presence, even before you’ve said a word! Sensitive Scorpio picks up vibes. You see every little detail, and you can read people like an open book. Once your friends get used to your high-intensity style, they know that you’re fiercely loyal. Anyone who betrays you had better watch out! Like a Scorpion, you’ll deliver a painful sting of revenge. Since your sign is naturally secretive, work on being more open with people. This will develop trust, and improve your relationships. Scorpio’s concentration powers are amazing, but be careful not to get obsessed. Curb any jealous or possessive feelings by pouring your energy into a creative project or passion. The ruling planets for Scorpio are Mars and Pluto. Pluto is a force for change that can be destructive in its power. Pluto rules Scorpio, and is exalted in Leo. Pluto is related to will, and intense passion, and has a reputation for ruthlessness. As god of the underworld Pluto brings the deepest compulsions into the light. Its position indicates areas of life that must ultimately become transformed as part of the soul’s evolution.